Very professional service and fantastic staff. 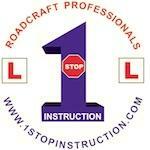 Training from CBT through to my MOD 2 passing first time with 1st Stop Instruction. Would not hesitate to recommend anyone. Valley Bike School, Motorcycle Training CBT 1. 1 Stop Instruction www.1stopinstruction.com 2. North London Motorcycle Training - www.northlondon-mct.co.uk 3. Alpha Motorcycle Training www.alphamct.co.uk 4. Metropolis Motorcycle Training, London 5.